As 2013 has come to an end, it is always common to reflect on the past year. 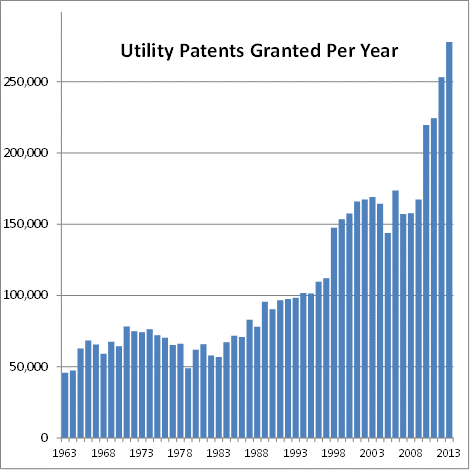 In 2013, utility patents have broken a new record at 277,861 patents issued which is a ten percent jump from the previous year. In fact, this is the fourth year in a row in which utility patents have broken a new record with 2012 patents ending at just over 250,000 utility patents which was eleven percent jump from 2011. Utility patents are those that protect function. They are the most common filed at the U.S. Patent Office. The benefits of a utility patent are that it protects the function of the invention, it covers a broad range that makes it hard for a competing company to avoid patent infringement, and it can protect different variations of the product with a single patent. Although there are added benefits, there are cons as well being that it is more expensive, it takes longer to obtain – about 2 – 3 years, and it does not necessarily protect the fixtures of the invention. There has been a link to the rise of utility patents to the appointed director of the USPTO David Kappos by President Obama. Since 2011, his focus was addressing the backlog of cases that were pending. This jump from 2012 is worthy of mention as the office was held back by the Federal spending sequester. There was also he focus this past year on implementing the procedures of the America Invents Act where under Section 3 priority is given to the first inventor to file a patent application. Special thanks to Katrina Nicha for researching and writing this post! ← “Let’s Play” – No Way!